Today Mo has given us the prompt IRON. The pictures below (they aren't mine) tell of the IRON Pillar in Delhi, India. 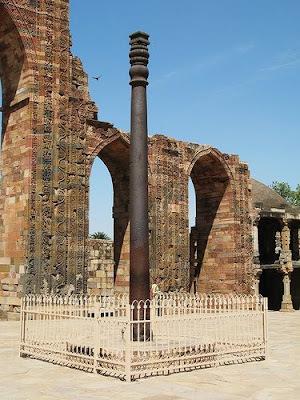 The iron pillar of Delhi, India, located in the Qutb complex, is an important testimony of the history of metallurgy in the Indian subcontinent, and of the history of ferrous metallurgy in general. The pillar—almost seven meters or 22 feet (6.7 m) high and weighing more than six tons—was allegedly erected at the times of Chandragupta II Vikramaditya (375–413), The dating of it as given by various authorities to be as early as 912 BCE. 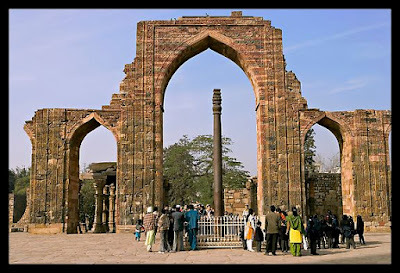 It is the remaining piece of a Hindu and Jain temple complex which stood there before being destroyed by Qutb-ud-din Aybak to build the Qutub Minar and Quwwat-ul-Islam mosque. Qutub built around it when he constructed the mosque. Your "iron" will be long remembered. Mine is best forgot. :-) I really like the Iron Maiden clip. Not the usual taste in music but fascinating. I've never heard of this iron pillar in which you speak. Very cool! Rock on, Teach. Happy MM! love the photos, the info, and the rock! Wow! That was a cool post! That iron pillar is amazing, and all the info, too. How interesting, have you seen it "life" ?? That was interesting. Youngest son is a big Iron Maiden fan. Interesting. I would like to visit this. Only YOU would incorporate a wonderful teaching lesson and juxtapose it with Iron Maiden. You ROCK, Mary! Love it!!!!!! Wow...that is crazy and interesting as usual Mary. A real pillar of strength! hahaha! I was surprised to see a post today, Mary. I thought with classes beginning you'd be posting only for the photo memes. My sister Janice (My Bellavia) returns to work tomorrow for the first time in over 20 years! All 4 kids from 8-20 return to school and college on Wednesday! Janice is doing a serious Happy Dance!! The odd part is, she's going to be in school, too, only this time rather than as a student or as a Mom, she'll be a PA to a special needs child - something for which the last 20 years has left her uniquely qualified! I had heard about the iron pillar but didn't really know anything about it. And thanks for the Iron Maiden! This is a fabulous post!! I am so glad you posted it as it is interesting historical information. I posted wrought iron too, haha.